Grifco have finally released the perfect motor for commercial sectional doors which are operating at a high cycle and need to be quiet, safe, reliable, powerful, and adaptable. Backed by a 2 year 100,000 cycle warranty, the Grifco S Drive is now available from Door Doctors. With a battery backup that can provide over 100 cycles before running out, a 100% duty cycle, 20cm per second travel speed, and a low profile, attractive and lockable enclosure, we’re installing these in places like carparks, emergency services building, commmercial tenancies, and much more. The S Drive is a product we’ve been waiting for – up until now commercial door automation for sectional doors was a problem – the products available didn’t have great warranties, needed frequent servicing, and could be very loud. The S-Drive starts and finishes its travel slowly before speeding up to 20cm / second. This minimises noise and vibration for adjacent / overhead apartments or offices. Since it has no wheels or other moving parts, the slider can’t derail, seize up, or make a lot of noise – and since the product is only 200mm high, it’s ideal for all carparks, even those with low ceilings. 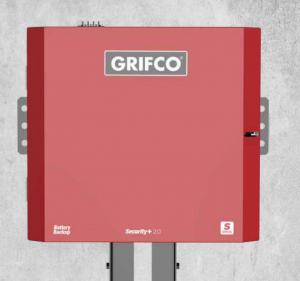 The Door Doctors are proud to offer the Grifco S Drive which we believe is the perfect choice for those looking to install a reliable, durable and powerful commercial sectional door motor. If you have a high usage sectional door you want a quality motor for please give us a call on 3299 2992, email us, or click here to fill out a contact form on our website. We’ll get in touch and advise on how our experienced and friendly technicians will be able to help you benefit from the Grifco S drive. If you want to read the product brochure please click here to view.